John McAfee, the inventor of the McAfee AntiVirus Scan demands an apology from the Government of Belize after members of the Gang Suppression Unit (GSU) stormed into his estate located on the outskirts of Orange Walk Town. The 66 year old expatriate was the subject of an aggressive search and 14-hour long detention by police that eventually required US Embassy intervention to secure his release. The wealthy US investor, who moved to Belize in 2008 and spends his time between homes in San Pedro and Orange Walk, says that not only was he a victim of an aggressive search but his doors were busted open despite being unlocked. In an exclusive interview with The San Pedro Sun on May 9th, McAfee recalled that sometime around 6AM on Monday, April 30th, GSU personnel descended on the mainland property, namely the Belize Ecological Foundation Limited, located next to the Tower Hill Bridge in Carmelita Village, Orange Walk District. After the GSU officers entered his estate, McAfee said that his dog, Caramelo, was shot and killed. Thereafter, the men broke down doors and ransacked the nine houses on the compound. "I was awakened by a commotion; megaphones and dogs barking and people yelling. I went outside and saw a lot of soldieries in attack formation coming down the driveway with automatic weapons," said McAfee. According to Police, present at the time of the search were John McAfee, his 17-year-old Belizean girlfriend, four security guards, 33 year old Emerson Michael who claimed to be the Chief of Security, 23 year old Emerson Dominguez, 46 year old Austin Allen and 23 year old Tyron Morales who are all Belizean nationals. Also present was Michael's common-law wife Princesa Ericson. 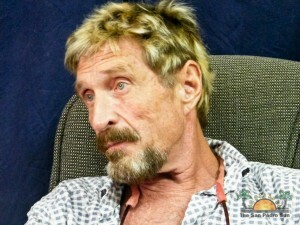 McAfee explained however, that he was handcuffed with 14 other people for over 14 hours. While McAfee said they showed him a search warrant, he did not get a chance to read it. Police claim that during the search ten firearms were found. The firearms were seven 12 gauge pump action shotguns (one of which had a scope), one 12 gauge single action shotgun, one Taurus 9mm pistol and one 9mm CZ pistol. Five air rifles with scopes resembling sniper rifles that use 6.26 mm slugs were also found along with two hundred and seventy 12 gauge cartridges, thirty 9mm rounds and twenty .38 rounds. According to McAfee, the firearms belong to the security company his business owns. The GSU reports that all the firearms and rounds of ammunition were scattered over the premises including inside the vehicles and houses that were unoccupied. According to the GSU, McAfee produced a company firearm license for all the weapons and ammunition with the exception of one firearm that is licensed to Tyron Morales and a 9mm CZ pistol with serial number A796245. The report further stated that McAfee could not provide a firearm license for the 9mm CZ pistol and a check at the Police Headquarters in Belmopan verified that no record appeared for a firearm license for the given gun found on McAfee's property. However, a “letter of approval” for the transfer of the firearm from one Jennifer Erwin to McAfee was provided to the GSU that explained how the gun was on the premises. According to the GSU the letter was signed by a senior officer but the matter is still under investigation since the “letter of approval for transfer” had no serial number or brand of the firearm, something that is unusual. However, McAfee said that, all his documents were in order. During the entire operation, which lasted some 14 hours, McAfee, along with those found on the property were handcuffed while the GSU conducted their search. After the operation, everyone, including McAfee were transferred to the Queen Street Police Station in Belize City where police conducted several checks to verify their information. After all checks were made, McAfee was released around 2AM on Tuesday, May 1st without any charges being brought against him. Of all the people detained Emerson Michael, Austin Allen and Emerson Dominguez were found not be licensed security guards and as such arrested and charged for "providing security services without a license". McAfee said that he was released from police custody only after the intervention of the United States Embassy personnel in Belize. "It was a very rude day from day one," said a very "pissed off" McAfee who is now demanding an apology for being put through an unnecessary and embarrassing ordeal. He is moving forward in filing a number of lawsuits on behalf of the 12 people who were detained, handcuffed and released without charge. The lawsuits are merely to call the "attention," of the authorities said McAfee. "If we don't get any satisfaction in terms of disciplinary action or an apology then we will file a very major lawsuit," said McAfee, who was left to sit in handcuffs in view of the public including his business partners, residents of the area and tourists. As a direct result of the incident, over 29,000 articles have been written and posted on the internet about McAfee's ordeal with the GSU. "I am not asking for much. Give me an apology. You have stormed into my residence; I should be pissed off and I am pissed off. I was doing nothing wrong. It was a bunch of rumors that was unsubstantiated which the government should have checked out before all of this… that made me look ridiculous so of course I am pissed off," explained McAfee. The GSU says that as part of the search, they also found a laboratory where it appears that antibiotics are being produced. A GSU press release states that "Analysts at the Forensic Laboratory, and personnel from the Ministry of Health were taken to inspect the facility and samples of an alleged antibiotic apparently being manufactured at the laboratory were taken for analysis. The Ministry of Health has already confirmed that no license has been granted to McAfee or any of his agents to manufacture antibiotics in Belize." McAfee explained that when the laboratory was operational (now closed for over 18 months) it had been used to produce antiseptics, and not antibiotics. The Director of Health Services, Dr. Michael Pitts, indicated that neither the Ministry nor the Chief Pharmacist in Belize had knowledge of such operation conducted by McAfee in Belize. Dr. Pitts has stated that both terms "antibiotics" or "antiseptics" are a matter of "technicality", but McAfee says, "If they can prove in court that they are the same I will eat my shoe!" In Belize producing antibiotics without a license is an offence under the Antibiotics Act in Belize. A decision as to whether or not charges against McAfee will be issued will be taken by the Ministry within the next few days when the report from the Forensic Analyst becomes available. Regarding the pet killed in the operation, the GSU says that "three of eleven dogs on the premises attacked and bit one of the GSU officers on his right thigh and the same dog proceeded to attack a Belize Defense Force (BDF) soldier who responded by fatally wounding the dog." The GSU says McAfee had $19,650 in cash in his bedroom, which was counted and secured by him. The raid on McAfee's property was conducted jointly by a total of 42 GSU officers, BDF and Belize Special Assignment Group (BSAG). According to the GSU, before entering McAfee's premises they announced their presence and purpose of search stating it was for "drugs and illegal firearms". They further stated that the operation was based solely on information received about suspected illegal activities being conducted on McAfee's property. However, McAfee believes that the raid was solely based on "rumors" by past "disgruntled employees" and to settle a vendetta by a "local politician" whom he would not give a donation to during recent elections. McAfee has donated several times to the Ministry of National Security. In 2009 McAfee made a donation of a vessel worth over $1 million to the Belize National Coast Guard. He has also donated to local police departments on different instances. In 2008 McAfee donated two All Terrain Vehicles (ATV's) totaling $40,000 in value to the San Pedro Police Department. In addition, more recently in 2011, he donated a number of equipment to the SP Police valued at over $3,500. The GSU claims that two months ago a Special Police team attempted to conduct a similar search on McAfee's premises but were prevented from doing so. Again, McAfee was not charged although two security officers were charged for the minor offence of providing a security service without a license. McAfee said that if he does not get an apology by Friday, May 11th he will be soliciting the services of Robert Hilton, a senior lobbyist in Washington, DC to get the US State Department to issue a Travel Advisory against Belize. Police Officer arrested and charged for "attempting to corrupt an officer"